Michael was compelled by the music of India after hearing it initially as a teenager in Portland, Oregon. The rich musical heritage of India has been integral to his development as a composer and performer. He began vocal music study with Pandit Pran Nath in 1984 and later in 1996 became his disciple and studied with him to India. After Pran Nathji's passing in 1996, Stirling continued study of this celestial art form with the Pandit's senior American student, the highly regarded composer and performer, Terry Riley. Mr. Stirling has accompanied Pran Nathji and Mr. Riley in classes and concerts in America (at the Rothko Chapel in Houston, Texas) and in India (in New Dehli at the dhargha of Sufi Hazarat Inayat Khan) as well as in California and Oregon. He has also studied and performed with Ustad Hafizullah Khan, Sri Karunamayee, Ustad Mashkoor Ali Khan, Lakshmi Shankar, the American bansuri performer Steve Gorn, and numerous others. 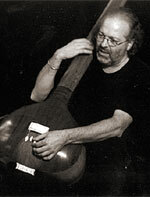 Stirling has also performed extensively with his Kirana West colleagues, Rose Okada and Rik Masterson. Mr. Stirling has collaborated with poet/Sanskrit translator Andrew Schelling (Naropoa Institute in CO) on several recent compositions for strings and voice. Michael's musical works utilize and blend instruments and forms familiar to both Western classical and North Indian classical musics. Michael works as an arts administrator/development coordinator and served the community as a member of the Board of Directors of Kalakendra, Society for the Performing Arts of India. He teaches North Indian classical vocal music in Portland, Oregon and at Amrita, a Sanctuary for the study of Yoga. His musical works have been performed at many Portland and Oregon cultural events and institutions including the Portland Poetry Festival, Portland Art Museum, Portland Center for the Visual Arts, Reed College, the Oregon Bach Festival, and KBOO, KOAP and KBPS radio. Outside of Oregon his works have been performed at New Music America (1986 TX), Soundworks (Seattle, WA), Roulette (NY 1983), Cheney Cowles Museum (Spokane, WA), Asian Art Museum (Seattle, WA), and KING Radio (Seattle, WA). He has received grants and awards from Meet the Composer (1986), Metropolitan Arts Commission (1990) and Art Matters (1990). In 2003 he was awarded an Artist Residency from Caldera for musical composition. Michael's composition, In the Cane Groves, performed with the ensemble Fear No Music in 2002, was reviewed in the Oregonian as "most memorable . . . captured the ear with its sinuous shape . . ."
John Da'ud Constant is one of Pandit Pran Nath's longtime, senior North American disciples and a student of Sufism under Pir Vilayat Inayat Khan and Pir Zia Khan. He is former Director of the Montreal Sufi Choir and the Montreal Sufi Center (Ste. Anne de Bellevue) and founded the Canadian Kirana Center (Vancouver) in 2000 to promote Kirana Raga singing. John has taught and concertized extensively in Montreal, Toronto, Kingston, Hamilton, New York, San Francisco, Berkeley, and Portland and on KPFA radio and CBC TV. After studying classical guitar with Eugene Lucas (Toronto) and composition with Don Steven (Montreal) he met Pandit Pran Nath in the 1970s and studied raga with him continuously until his death in 1996, living and working intensively with him in Berkeley, California for 7 years. In April 1990 Pandit Pran Nath initiated him into the lineage, saying, "Today you are Kirana." He subsequently taught raga classes with Pran Nath and accompanied him in concerts, including performances at the San Francisco Festival of Voices, KPFA radio and on Kronos Quartet's Short Stories CD. John currently composes and teaches in Vancouver and is working on a comprehensive book on Kirana Raga, at Pandit Pran Nath's request. Since March 27, 2004, he has performed as a vocalist with the Just Alaap Raga Ensemble with La Monte Young and Marian Zazeela in New York. Brian Crittenden worked as a bassist in the 70s on the west coast with various jazz artists. In 1980 he moved to the bay area to study with Pandit Pran Nath. 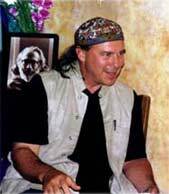 Brian lived with Guruji, became his disciple and studied with him for 12 years. In California he worked with Pandit Pran Nath, fellow student Terry Riley and recorded with Grateful Dead drummer Mickey Hart. Brian moved back to Portland in 1996 where he sings and lives with his wife and critters. Brian became a disciple of Terry Riley in 2005 at a beautiful ceremony during a raga retreat at his home. Shabda Kahn has been a disciple of Sufism since 1969. He is a direct disciple of Murshid Samuel Lewis (Sufi Ahmed Murad Chisti) and worked closely with the great American Mystic Joe Miller. Shabda is currently the Pir (Spiritual Director) of the Sufi Ruhaniat International and the Director of the Chisti Sabri School of Music. He is also a disciple of the illustrious Tibetan Buddhist Master, the 12the Tai Situpa Rinpoche. He spent 24 years (since 1972) developing as a vocalist under the living guidance of the late Pandit Pran Nath, the Master North Indian Classical Vocalist, who planted the 800 year old oral transmission of Chisti Sufi Vocal Music in the Western world. Shabda has appeared in concerts ranging from Visions for a Perfect World at New York's St John the Divine Cathedral, for His Holiness the Dalai Lama, New Music America in Chicago, at Delhi University Music School and Shivaratri Festival in New Delhi. He is one of a handful of Americans who have dedicated themselves to carrying on the legacy of the treasure of North Indian Classical Vocal Music. Shabda travels throughout the world spreading the Sufi Message of Love, Harmony and Beauty. Shabda brings warmth, humor and clarity in his efforts to help seekers on their Path to Awakening. John Sackett received a B.M. from the San Francisco Conservatory of Music where he studied clarinet with Alan Balter and composition with John Adams. He received an M.A. in composition from Mills College, studying with Terry Riley, and Ph.D. from the University of California at Berkeley, where he studied with Andrew Imbrie and Olly Wilson. He has also been a student of North Indian classical vocal music and studied with the renowned vocalist Pandit Pran Nath for twenty years, traveling with him to India in 1990. As a clarinetist, he was a soloist with the Minnesota Orchestra at age 16, he received a fellowship at the Berkshire Music Festival at Tanglewood, and he has performed with Terry Riley's legendary group Khayal in the Bay Area. He has received a composition grant from the National Endowment for the Arts and the Charles Ives Composition Award from the American Academy Institute of Arts and Letters. 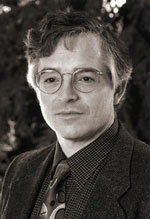 He is presently on the faculty at the University of California, Santa Cruz. Shabda Kahn biography © Marinsufis.com.